China’s economy likely has slowed down earlier and more than the official data suggests. We expect that the turnaround should take another one to two quarters as there is a two to six quarter delay between easing and its impact on the economy. 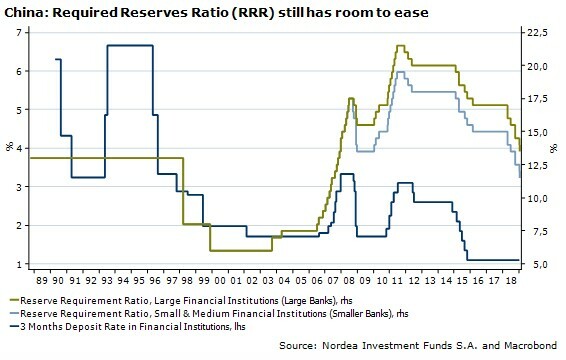 To help this recovery, the People’s Bank of China (PBOC) has cut the Required Reserves Ratio and we expect three more small cuts as an insurance—it has plenty more room. In addition, we expect the PBOC to quietly force more recognition of bad debts. The PBOC already forced lenders to reclassify as bad loans those due for more than 90 days, but the underperformance of banks suggests that the market has doubts. This embedded credit risk leads to wild swings in the Hang Seng Financial Index H Shares index, moving sharply higher or lower depending on sentiment. For example, we are currently down almost thirty percent from the previous peak.